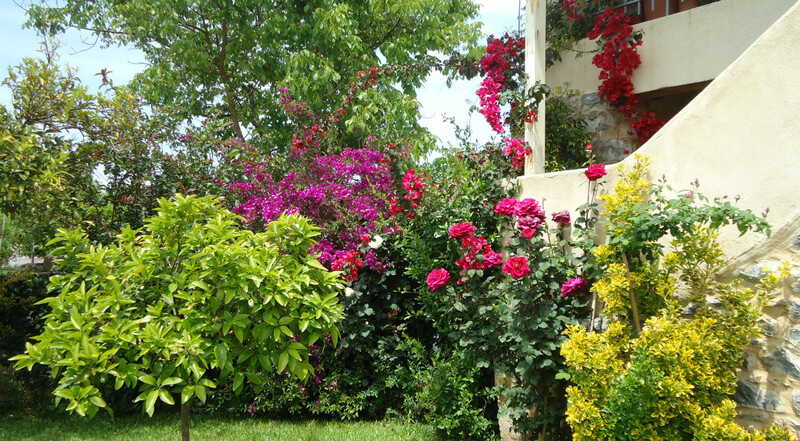 The photograph above was taken in our garden in the summer of 2014. Photograph by cidman321 at Flickr. 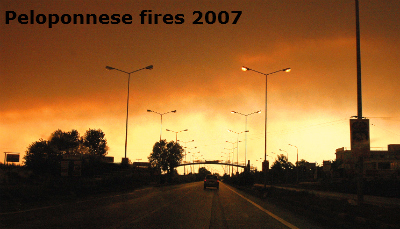 The 2007 Greek forest fires were a series of massive forest fires that broke out in several areas across Greece throughout the summer of 2007. The most destructive and lethal infernos broke out on 23 August, expanded rapidly and raged out of control until 27 August, until they were put out in early September. The fires mainly affected western and southern Peloponnese as well as southern Euboea. Photograph by Festblues at Flickr. The death toll in August alone stood at 67 people. In total 84 people lost their lives because of the fires, including several fire fighters. Prime Minister Kostas Karamanlis declared a state of emergency for the whole country and requested help from fellow members of the European Union. Multiple countries responded to the call and sent help - mainly fire planes. 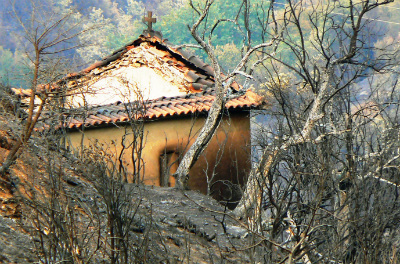 A total of 2,700 square kilometers of forest, olive groves and farmland were destroyed in the fires and also 1,000 houses and 1,100 other buildings, with hundres more damaged. .
Six people were reported to have been killed in the town of Areopoli. In Zacharo, one of the worst hit areas, more than 30 people were found dead by firefighters while searching burning cars and homes. The last photograph was take near Zacharo in the Spring following the fires. 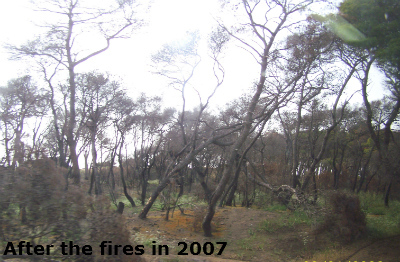 We had been living in the Peloponnese for 2 weeks when the fire broke out. We were told in the morning that the fire was 20km away up the mountain to the side of the village. During that day we watched as the fire burnt down the mountain towards the village, the sky went very dark, the sun turned red and ash started falling. At 4.30pm we were told that the village was being evacuated and that we would have to leave. However, some of the villagers remained to fight the fires, some of them working for 36 hours non-stop. Very brave. We put our 5 dogs and our cat into the car and went to Kalamata near the beach. 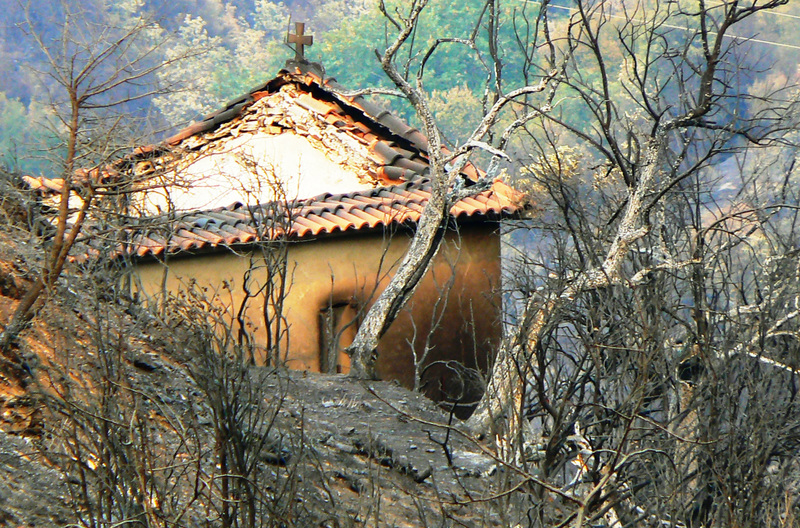 All night we watched the fires burning on the Taygetos Mountains above Kalamata. Next day we set off back to the village not knowing what we would find, however, the dry river bed had stopped the fire. We were lucky. It is believed that many of the fires were started by arsonists and I understand that there have been recent court cases with regard to the fires around Zacharo. 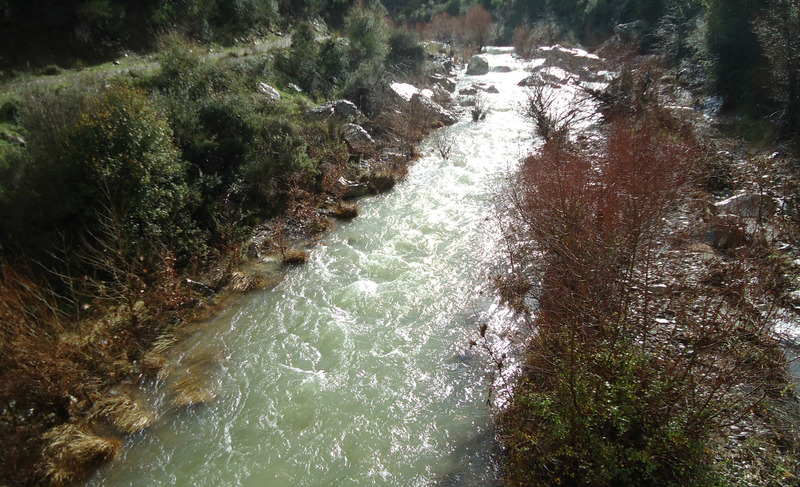 Our village river in the winter looks like this when we have had plenty of rain. The photograph was taken in 2014, since we have lived here I have never seen it so full. I believe that the river is called Rema Mavrozoumena, its source is in the mountains above the village, it is a tributary of the Pamisos River and comes out into the sea near Messini. 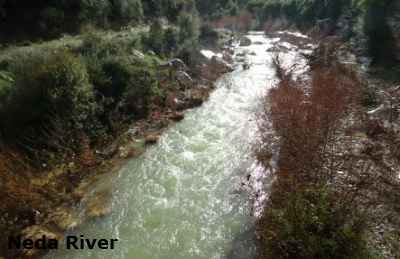 The river dries up in the summer and it was this river bed that stopped the fire reaching the village in 2007. The views from the Diakopto to Kalavryta train are amazing. 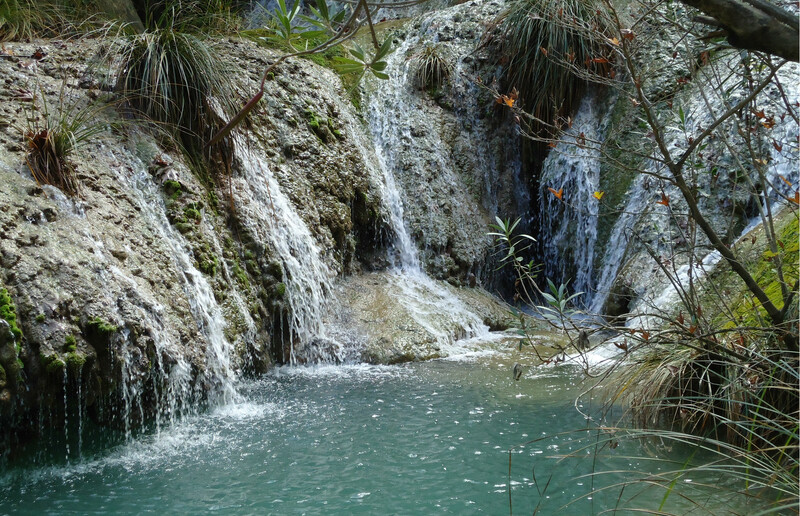 The river is the Vouriakos and the stream bed runs along the gorge following, in places, the railway track and you can see many such waterfalls. 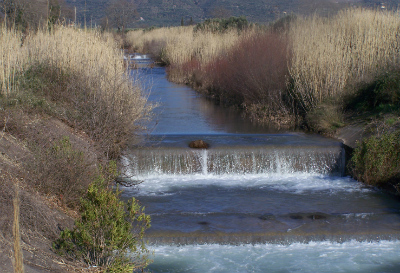 The Neda river's source is on the southern slope of Mount Lykaion, near the village of Neda. 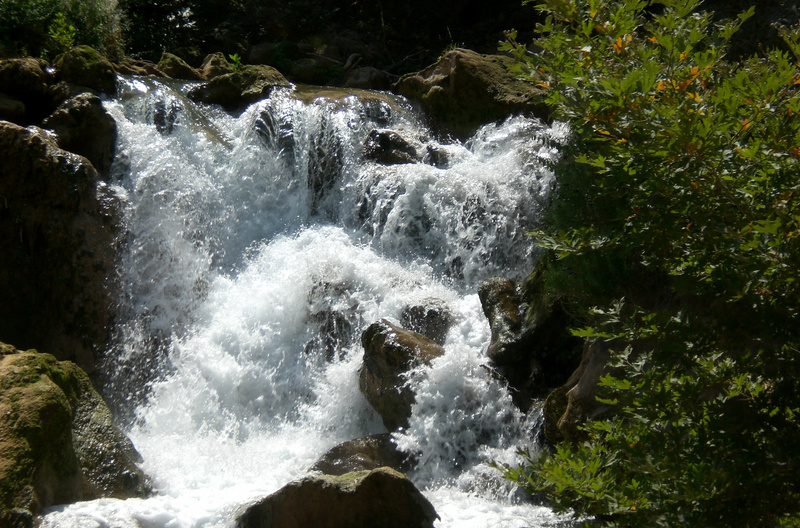 It flows to the west through a varied landscape of barren rock and forests up in the mountains. Polylimnio late in the year is usually deserted and the pools and waterfalls have much more water in them, especially if we have had a lot of rain. This was taken during a visit in late October. The Mani Peninsular is famous for its towers. There are 3 kinds: the war tower, the tower house and the tower dwelling. 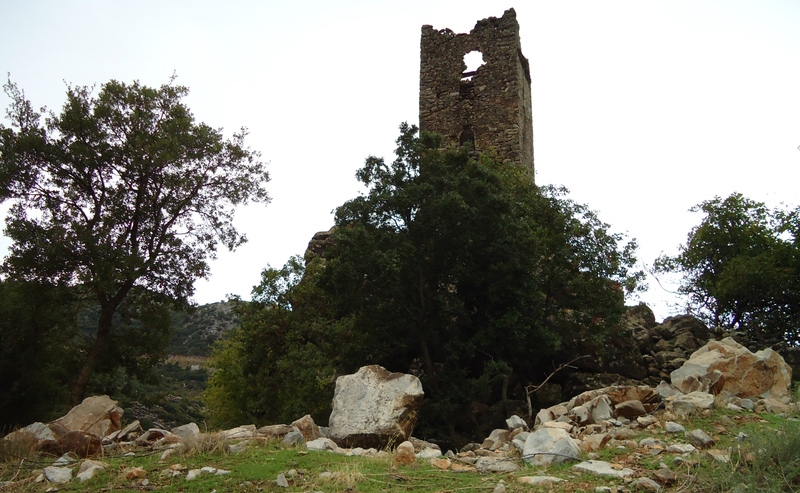 On travels in the Mani many ruined towers can be seen. As well as serving an obvious military purpose, the towers were an outward sign of clan strength and unity. The height, strength and armament of a tower was an open display of power. Photograph courtesy of Robert Wallace at Flickr. 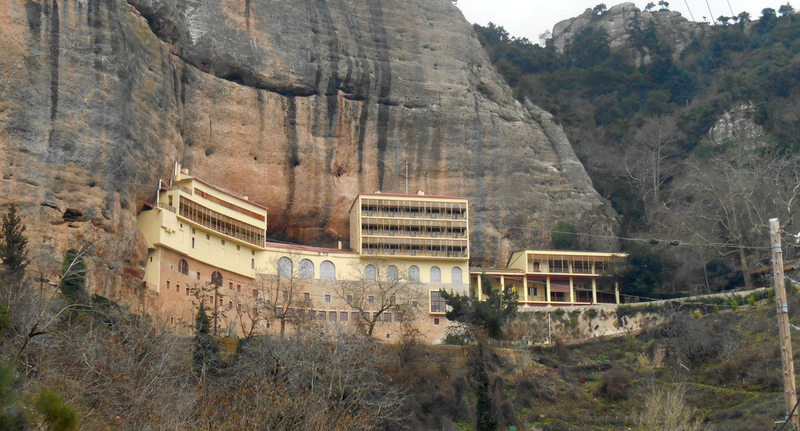 The Mega Spileo Monastery is situated 10km away from the town of Kalavryta built on the steep side of a 120m high rocky hill. The monastery's cells have been built around the entrance of a cave. The monastery was founded at this site in 362AD by two brothers, Symeon and Theodore. 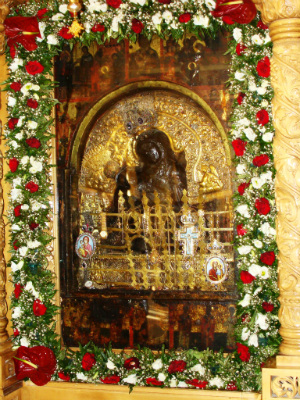 An icon of the Virgin Mary created by the Apostle Luke was found deep inside the cave by a shepherd girl. Photograph by anthusa2011 at Flickr. In 840 A.C. the Mega Spileo was burnt down, it was rebuilt in 1285, by Andronikos Paleologos. From then on, this monastery became one of the richest in the country. The monastery went through another two fires, in 1400 and in 1600, at which point the church was burnt down along with the precious library containing rare manuscripts. 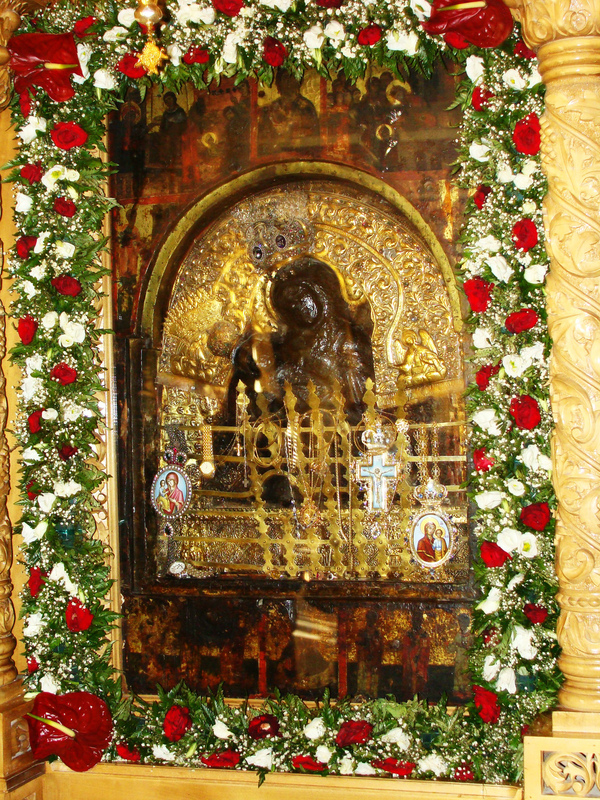 In 1934, the monastery went through yet another fire during which invaluable relics were destroyed. In 1936, the monastery was rebuilt but suffered severe destruction in December 1943 at the hands of German troops. Many of the monks and other staff members were either shot or were thrown over a cliff. Some managed to survive, hidden in nearby caves, taking with them some rare icons and relics. Today, you can admire a number of important and unique items which are kept in a special hall. Under the foundations of the Church of Agia Theodora, the water of the source of the Pamisos River flows. A 100 metres or so further down, can be seen an old watermill (neromylos) that has been renovated and converted into a restaurant. 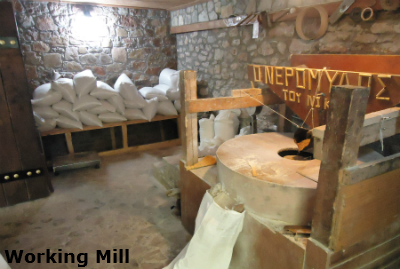 The owners are very happy to show you the mill working, grinding flour with which they make their own bread. March 25th is Greek Independence Day, when the whole country remembers and celebrates the start of the liberation of Greece in 1821 from 400 years of Turkish occupation. The celebration in our local town involves all the schoolchildren, from little ones to seniors, dressed in traditional costumes. 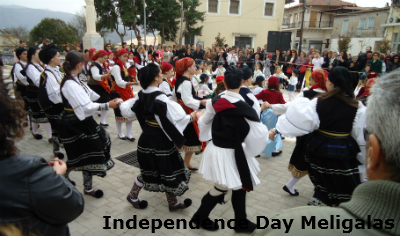 It begins with a march down the street and into the main square, then there are speeches from many of the children and finally Greek dancing. Just out of the village of Vasiliko heading towards Kyparissia there is a turning to the left. 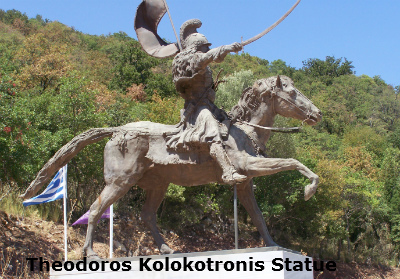 The newly built road snakes up the mountain until you come to a plateau where stands a huge bronze statue of Theodoros Kolokotronis on his horse. 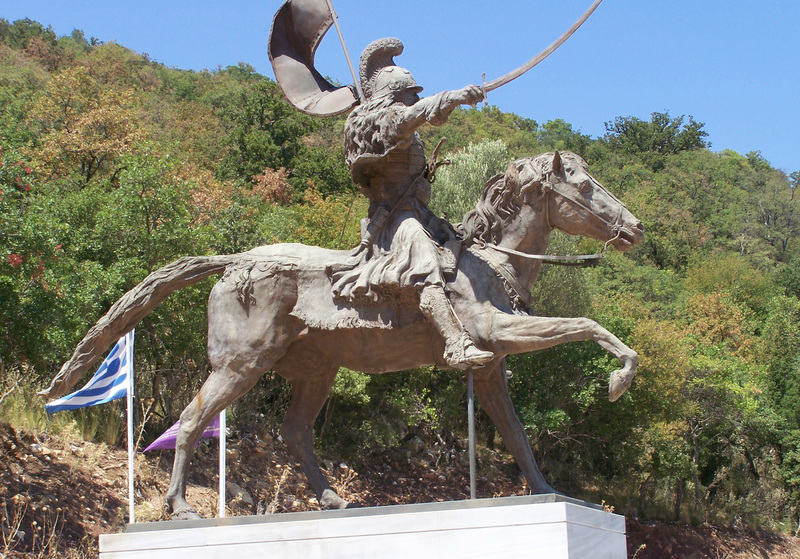 He was a Greek general and the pre-eminent leader of the Greek War of Independence against the Ottoman Empire. There is also the small church of Agios Stefanos. Locals say that Kolokotronis was born near this site and was baptised on a font made of stone (the whereabouts of which is unknown). There is also a picnic area with wooden tables placed in the shadow of plane and mulberry trees. 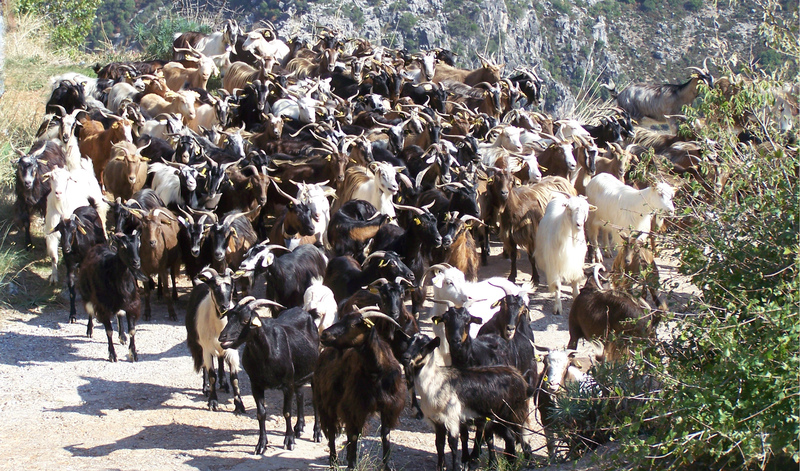 We saw this huge herd of goats just outside the village of Tseria on the Mani. There are many such herds, but I have not seen one as large. There are also big flocks of sheep, which I understand are all milked by hand!! 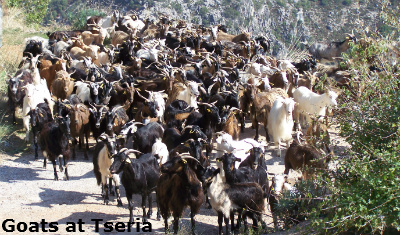 Feta, mizithra and anthotyros cheeses are traditionally made from a mixture of goat's and sheep's milk. There are many other Greek cheeses, many of them have Protected Designation of Origin (PDO), Feta was given this in 2002. This is interesting. Visit The Greek Cheese Page! 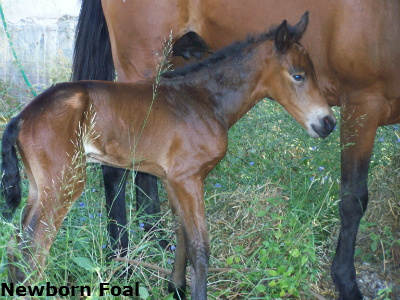 A foal on the day it was born - such an amazing sight, so fragile and wobbly in those first couple of hours. The horse belongs to our neighbour and it was wonderful watching the little one grow, following its mother everywhere!! On the road from Megalopoli to Karitena (on the left hand side) you will see a bird/animal sanctuary. I have tried to find out the name of it but have been unable to (we shall have to visit again soon). 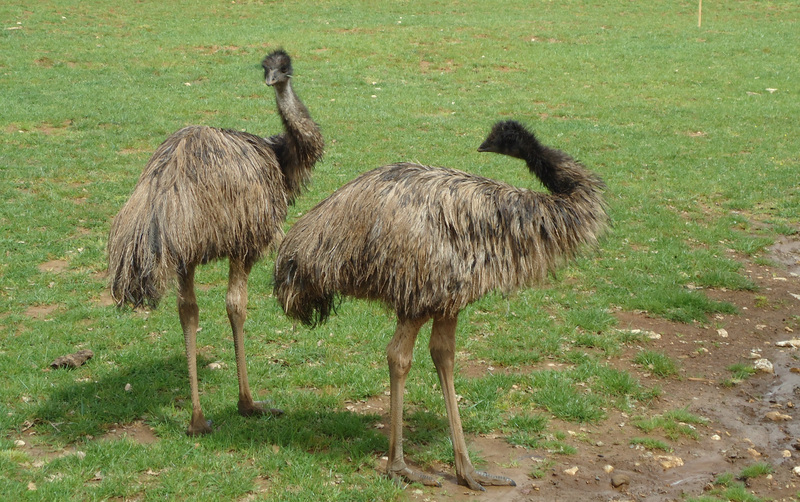 The site has many animals and birds and also very nice taverna and separate cafe. You can sit and have a coffee and watch emus, ducks and peacocks in the paddock. 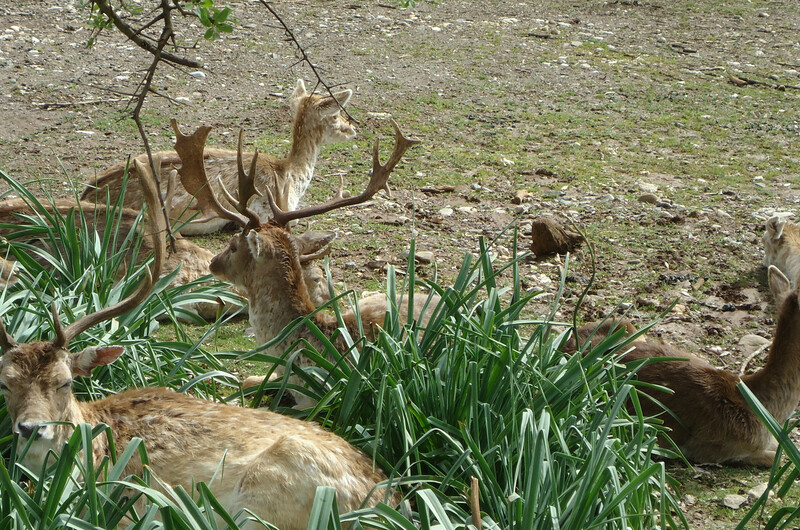 When we visited we saw horses, donkeys, a very large herd of deer (pictured) and many other animals and different birds. Well worth a visit! 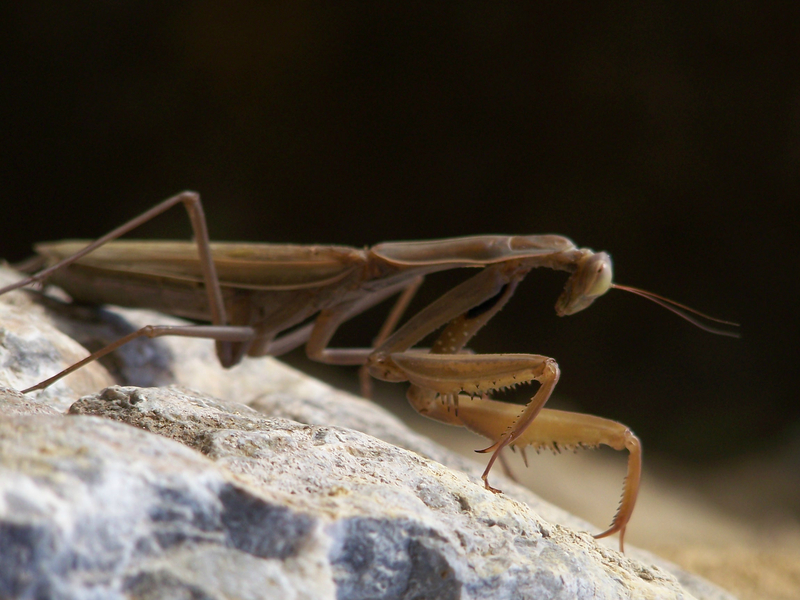 I took this photograph of a praying mantis in the garden, one afternoon last summer. If you ever manage to have one on your hand or you can get close to one, they will actually turn their head to look at you and their eyes are so beautiful. 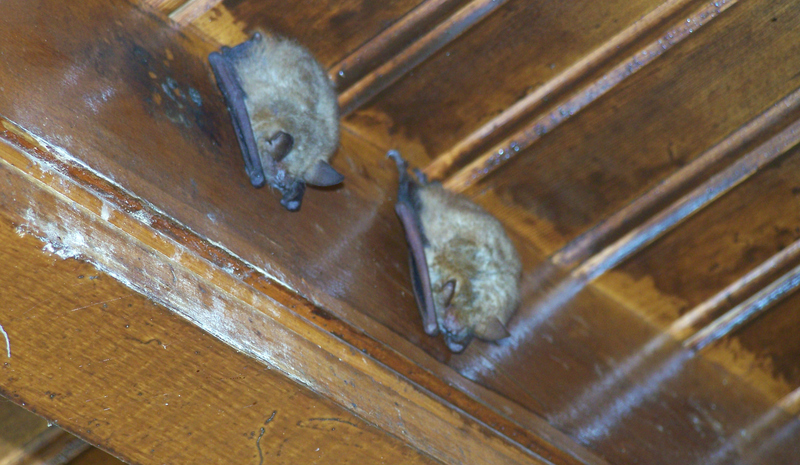 These two little visitors spent a few weeks sleeping every day under our veranda roof. 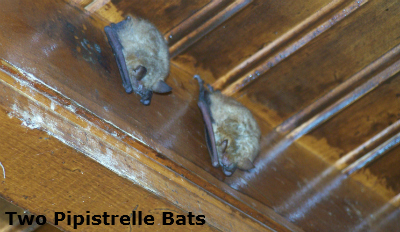 The common pipistrelle is one of the most common bat species. It is a small bat which is found in a wide range of habitats including farmland, woodlands and suburban and urban habitats. 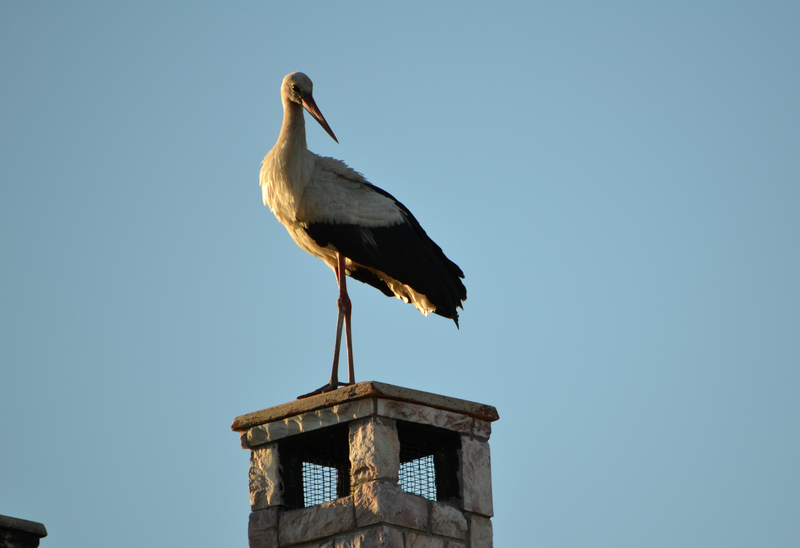 It often roosts in crevices around the outside of houses and buildings. It mainly eats small flies. Early one morning this heron was perched across the road from our house on our neighbours chimney. 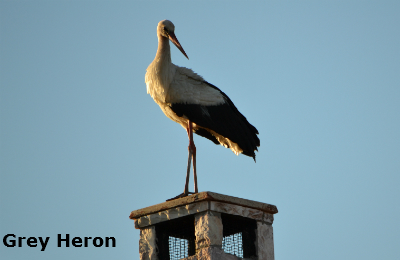 The grey heron (Ardea cinerea) is the largest heron in Europe. 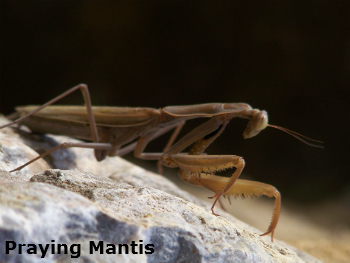 It has a long neck, a strong, dagger-like bill and long yellow legs. In flight, the neck is folded back, and the wings are bowed. In adults, the forehead, sides of the head and the centre of the crown are white, whereas in juveniles these are greyish. Finally we have the largest moth I have ever seen - it must have been 15cm across its wings. Saturnia pyri, the Giant Peacock Moth, is a Saturniid moth which is native to Europe. 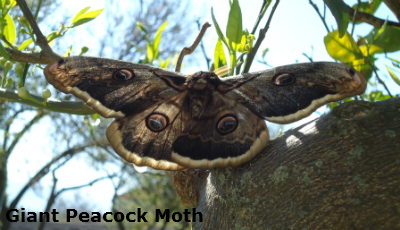 It is the largest European Moth and is also called as the Great Peacock Moth, Giant Emperor Moth or Viennese Emperor. This one spent a whole afternoon in an orange tree in our garden. It was such a wonderful sight - and we have had another one!! PLEASE NOTE THAT ALL PHOTOGRAPHS ON THE SITE ARE CLICKABLE LINKS.